Korngold's Much Ado About Nothing, Op. 11 has been arranged for viola solo and piano by the world-famous violist Donald McInnes, who held a professorship at the University of Southern California from 1985 to 2014 and is known in virtually every corner of the artistic world for his appearances with major orchestras, recitals, chamber music participation, and numerous master classes. Korngold originally wrote the suite Much Ado About Nothing in 1918-1919 as incidental music for chamber orchestra to the Shakespeare play. Premiering in Vienna in 1920, it enjoyed instant success and soon spread around the world in a series of arrangements, now further augmented by this exciting new version for viola and piano! 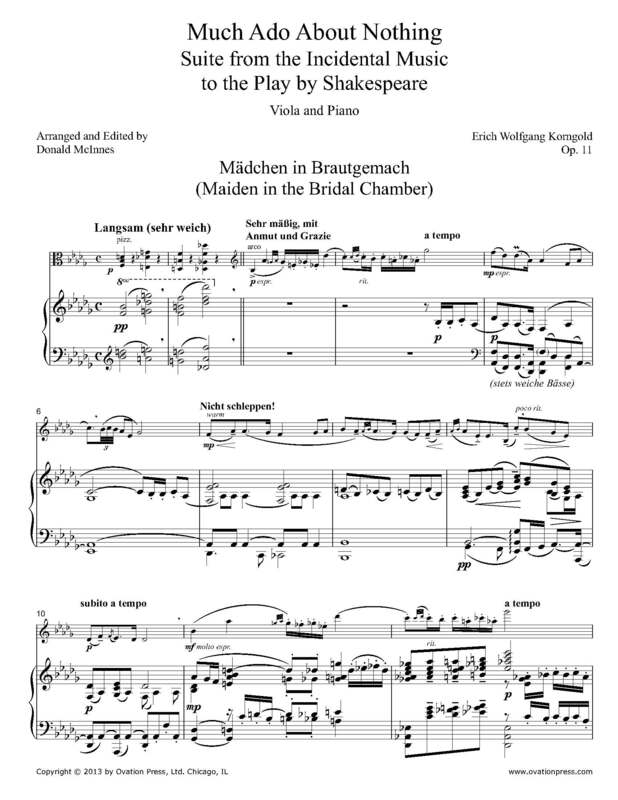 Download and print the score today to gain access to this expertly edited arrangement of Korngold's Much Ado About Nothing for viola and piano by Donald McInnes!